My initiation into the world of sales happened at the height of the “Glen Garry Glen Ross” days. It was the time of “blue suits” and “fast talkers”, and not a piece of sales automation or tracking technology anywhere to be found. We’d roam our territories searching for conversations hoping it would lead to something more. At the end of the day, we’d return to the office and put our “numbers” up on the board; # of conversations, # of leads, and closed deals ($). The white board was our “sales dashboard” highlighting performance against goals for the month, and year-to-date. Our view, and control over our success, was determined day-to-day. Over the last 25 years, sales has been enabled with a broad set of new technologies, from sales force automation to CRM to cloud based mobile sales tools. All aimed at helping the sales organization better track, measure, and achieve quota. And with each advancement in technology, sales has gained the feeling that it has more control over the process, and outcome. The buyer’s journey is marketing’s “shiny new penny”. Over the last couple of years, numerous consulting firms have produced research trying to map the journey with varying estimates on how late in the journey customers are now engaging sales. This is not necessarily “new” news – educated buyers have been engaging late in the process for years, and in some cases, bypassing the sales reps all together ordering direct. What’s different now is that we have better tools to track their behavior. It can be threatening – sales folks “cover” buyers, be it a prospect or an existing customers. Their job is to start a conversation and to continue the discussions to, hopefully, a successful outcome. They can’t be everywhere, or everything to everyone, but to suggest that they are not providing buyers with the right information at the right time, or that they may not be “covering” them will cause a defensive or hostel reaction. Be tactful in the way you present the findings. Buyers channel surf – don’t assume that buyers are only online in the early stages of the buyers journey, and likewise, that they are only talking with sales in the late stages of the process. Unlike the past, when we could estimate where customers were in the sales process by watching how they engaged with content and channels, buyers now use all channels, and all information sources, at all stages of the journey. Good sales people already get it – good sales people are very intuitive by nature. They already have a feel for how buyers research and purchase products. They also know how to use the best content and/or tools to help buyers advance their learning and to move the process. As a result, they will want to know how you can help them. Have a Plan – especially for the sales people I just mentioned. The question that you should expect to get after sharing the information is; “So what now? Given this new insight how should we change our sales and marketing approach.” Make sure you have an answer. The challenge, according to recent research, is that buyers are unable to differentiate your product or service from the 3-5 other companies they are also considering. To create separation, you must be able to illustrate and communication “personal value”. And that has not been a strength of marketing, but it’s a core competency of good sales people. Use this opportunity to partner with sales to developed content that resonates with buyers on emotion level deeper into their journey. Sales may be losing control over the buying process, but they know how to connect on a personal level with individual making the purchase decision, use that to your advantage. 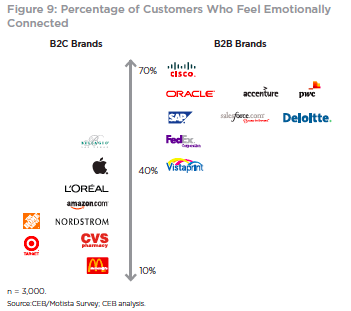 What company do customers feel most connected to emotionally? Apple? Nope. Amazon? Sorry. It must be Nordstrom’s then, right? Not even close. To find the company that has the strongest emotional connection with customers, you have to leave the consumer world behind. Blows your mind, doesn’t it. According to new research from Google and the CEB, customers are more emotionally connected to B2B brands, and it’s not even close. The company customers say that they are most emotionally connect to is…Cisco. Why? Well, it’s about understanding risk. The more risk involved with a purchase decision, the higher the likelihood of an emotional connection. Increase the variables related to risk (e.g. losing a job, wasting corporate investments) and you have the ingredients for an emotionally involved buyer. Personal risks peak when others are counting on you to make the right decision and the stakes are highest. How did Cisco become number 1? It has to do with Cisco’s ability to reduce risk with buyers. Forrester ‘s Evaluate Your Channel Partner Loyalty Program, surveyed over 250 hi-tech business partners to understand the drivers of loyalty. Partners were asked to select the reason/s “why their most strategic vendor is their most important vendor” (see the table below). 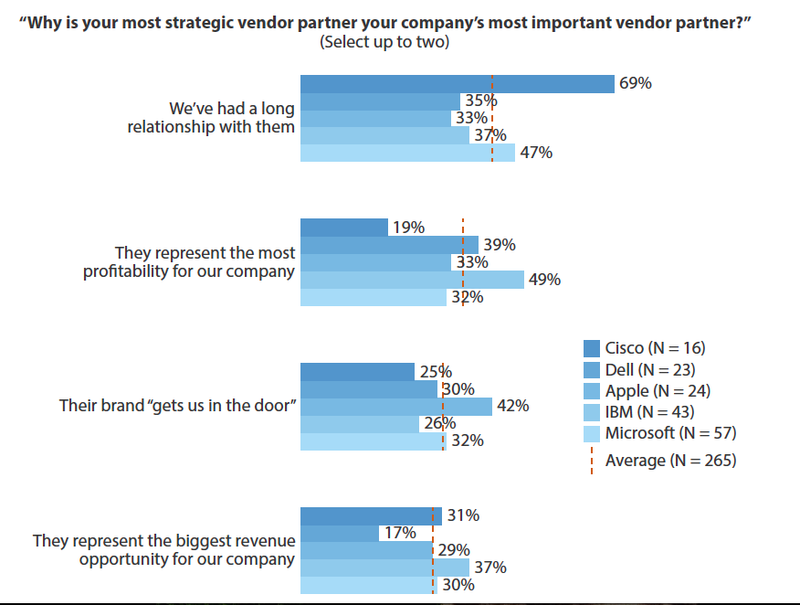 Partners, buyers of Cisco gear, selected Cisco for the strength of the relationship, despite that fact that Cisco was also the most profitable vendor (established earlier in the research). Cisco partners value the relationship more highly than other partners, 26% more. The reason is related to how Cisco is able to create and communicate what the CEB and Google research describes as “personal value” consisting of four parts; professional, social, emotional and self-image benefits. Some of which are communicated, others realized through the customer experience. For example, existing customers understand the “personal value” associated with an existing vendor 2X that of non-customers. Cisco has built a strong “personal value” equation by investing heavily in their partner’s success. It supports them professionally through training and certification programs. Invest in the brand to support the emotional bond and self-image, and in sales and marketing activities to drive demand. All of which reduces the risk associate with failure, be it personally or professionally. And in return, they trust Cisco with their livelihood, valuing the “Relationship” above rational drivers, like profits and revenue. How can we leverage this insight? To start, focus on better communicating “personal value” to non-customers. The research found that brand messaging connects with buyers early on, but the excitement wanes over time as we move down the buyer journey into the evaluation phases. The rational brain takes over to assess risk, and the complications associated with the purchase, at this point as much as 50% of the potential deals stall or fall out of the process. Risk impacts their initial positive emotions, and unfortunately, we don’t much to help them. To counter those feelings engage them with personal-value messaging, go beyond just using feature/functionality language (functional benefits) to describe products or services by combining the emotional and self-expressive benefits as well (see below). Like Cisco, understand how your products or services impact buyers. Does it make them feel “smarter” by having the latest technology, or more “secure” in their role. Although buyers are individuals with unique personalities, and should be treated that way, they most likely share the same fears, uncertainties, and doubts we have in our roles. Get to know them, like you know yourself. Stop assume they are always rational and buy on price and/or functionality. And finally, realize that there are customers who are emotionally connected to your brand, and/or highly value their relationship with your organization, and when they say that they “love your product or company”…they actually might just mean it. Big Bets – if you want marketing to be valued you have to understand, and link, to what the organization values. It’s that simple. If it’s market share, connect marketing objectives and activities to acquisition or/and account penetration. If it’s profit, understand the drivers and align your teams’ efforts appropriately. Big Strategy – once you understand how to link marketing to the business objectives your job is then to connect those big bets to day-to-day marketing activities. Your smarts will be needed to take the marketing requirements from the product and sales organizations (which may be very tactical) and link them to the overall marketing strategy that aligns to the “big bets.” Warning – this will require math, perhaps lots of it. Big Plays – to execute, organize your marketing objectives as defined by your internal stakeholders into 2 or 3 “big plays.” If market share is a key growth objective, a big play should focus on an area that has the greatest opportunity to do that…a specific market, product and customer. All marketing activities/campaigns should be nested around that “play.’ Messaging is critical here because it is the “big play” wrapper that creates consistency in the communication across execution –think “Smarter Planet.” IBM discovered years ago that the best performing campaigns stayed in market the longest, and had the highest level of integrated tactics. It takes focus and discipline to do, but if you can get there it will make your life easier by allowing you to organize everything under a big play umbrella, and if things don’t fit…then maybe you don’t do it. Big Results – the first rule here is to understand that measurement and reporting are different. Measure everything, but only report “process” or “results” metrics. Executives care about “outputs,” not “inputs.” Inputs are activities, outputs are results, know the difference. Big Balls – ya gotta have ‘em. You are going to have to get comfortable with, and embrace risk. If you do this right, you will be placing bets, that at the time, you will not know how, or if, they are going to pay off. Years ago, I worked with a CEO that committed to double the size of the business in three years. The CMO calculating sales cycles realized to support that growth marketing needed to double the number of leads that year. She had no idea how she was going to do it, but it caught the attention of the senior management team, focused her team, and it happened. But as she learned, you don’t try to go it alone. Reach out to others with your plan, get their buy-in and support. Level set expectations on timing and performance, it may require a significant investment in time and money for the “big bets” to pay off. Set big goals, but be realistic in getting there. The other interesting, and important nugget from the research is that marketing is playing a bigger role in influencing corporate strategy, and other functions. Make sure you’re capturing this opportunity at your organization by thinking, and by being — “Big”. On Father’s Day weekend I found myself facing a dilemma. With our kids’ sports over for the season, an “all about Dad” weekend, and a perfectly beautiful day, I was hell-bent on seizing the moment. I had everything to do, and all day to do it. On our deck with my wife that morning, I discussed the endless possibilities of how to capture the day: biking, hiking, sightseeing, road-tripping, etc. To my surprise, my wife said, “Why don’t you just enjoy the day?” Hence, the dilemma: What was the best way to do that? Was it by doing as much as possible, or by relaxing and enjoying my free time? My first instinct was to do as much as I could, so as to not “waste the day.” Trained to be task oriented, both from a busy work life and home life, I instinctively kicked into activity mode, never once considering relaxing and enjoying the day until my wife mentioned it. It’s something that has stuck with me ever since. I’ve complained to my wife that our schedule leaves me exhausted on Mondays and that we needed to plan or do “less,” only to now realize that I was the problem all along. My inability to relax, even on vacations, had earned me the nickname of “Eager McBeaver” from my brother-in-law. Hopefully, it is also a term of endearment. Searching for answers for reasons behind this hyperactive behavior, I went online. To my shock, I discovered that I was exhibiting “Type A” personality traits. I know many Type A people, and I would not describe myself as one, or at least I haven’t been acting like one. So how did I suddenly get this way? Much has been written about how technology has changed our lives, allowing us to blend our professional and personal lives, and enabling us to do more in less time. And our children’s lives, especially as they grow older, are very busy. Yes, they were contributing factors, but neither could fully explain my change. I came to the realization that my definition of a “good day” was now defined by how much I got done, and not necessarily by what I had accomplished. The daily routine dictated by a “to do” list, with the “speed of life” moving ever faster, wound me up like a toy soldier. My only consolation was that I was not alone in this feeling. This perpetual state of motion leaves many of us with the inability to sleep. What the body doesn’t complete during the day, the mind tries to finish at night. And perhaps the tension in our jaw or back, or both, is not from stress, but rather from the cognitive dissonance in knowing that what we have become is not who we truly are. Time Is Our Enemy – I realized that my training habits focused on going further in fewer minutes had spilled over to the rest of my life in trying to do more in less time. Years ago, I worked with a woman who was a single mother and an outstanding manager. I asked her what her secret was for balancing it all and getting so much accomplished. She said, “I’ve come to realize that there is only so much I can do in a day, and then there’s always tomorrow.” Sometimes I/we forget that there is a tomorrow. The Roses Have No Smell – They have no smell, because there is no time to smell them. As a result, we need to create or find a way to recognize an accomplishment no matter how small, before habitually moving to the next task. An entire day could pass, and I would have no idea of what I did, one day would bleed into another. The only way to distinguish them was by the unique tasks that needed to be addressed that particular day. Autopilot Mode – This default setting can take us completely out of the present. It removes our ability to recognize the “little things” that matter or happen in daily life. It can also be hurtful or harmful to others. So what did I do on Father’s Day? I slowed down and enjoyed the time. I stayed on the deck and read the paper in its entirety, watched a movie that I had only caught snippets of over the years, and went for a family bike ride with my head up, enjoying the sights—as opposed to staring at the bike computer to see how fast I was going. I know now that some of us (me) take the “carpe diem” thing a little too seriously. A little less seizing of the day, and more enjoying it is the order of the day. Yes, technology has enabled us to cram more into a day, but we’re the ones who operate it. Our lives aren’t going to slow down, but maybe we can find ways to enjoy it more by recognizing the opportunities for small “accomplishments” in daily life. Finding moments to hug our children is a small but important “win.” Taking the time to open the door for our wives before jumping in the car to race to a game or school event is a must. Celebrate a professional achievement, before moving on to the next task, after a job well done. There will be days when I’ll fall back into seize mode, but I also know that when I start feeling like the toy soldier being so tightly wound, I can go back and read this again, and hopefully, take a little pressure off the spring. Our air condition picked preciously the right moment to die — during a streak of the hottest weather of the summer. 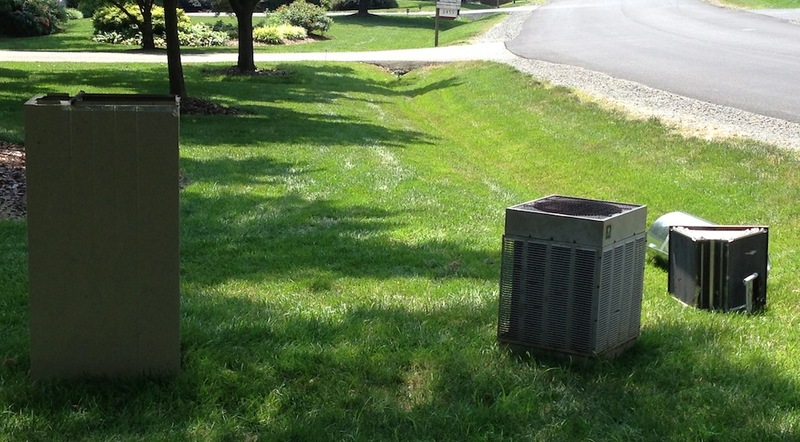 We knew the day was coming for 10 years, ever since the home inspector told us to replace the HVAC system. We’d light a candle and say a prayer every time the service van pulled up in the driveway. Our system was the definition of “they don’t make them like the used to” until a 90 plus degree-day, finally made it obsolete. Calling the heating and air conditioning repair shop that we had developed a relationship with over the years, we dug out the five-year-old quote to finally place the order. But first, we would have to endure ten days of oppressive heat until the unit would be installed. Fortunately, I had a favorable travel schedule that would take me out of town for five of the ten days. So, on the day of the installation, I took the bullet, or more accurately, the heat seeking missile, and stayed at the house waiting for the service techs…which also happened to be the hottest of the 10-day stretch. The techs arrived at 9 am, and I camped out on our deck to get some work done. With a 20-inch oscillating fan blowing my way, the day started off well. Walking through the house one of the techs commented that our house was the hottest house he had ever serviced…echoing the same comment the sales person made on his initial visit. Passing the thermostat, I noticed that the house had reached 93 by 11 am. Thanks to a new roof and windows, our house held temperature in like an oven, which it was quickly becoming. By mid-day the house was 95 degrees and showed no sign of stopping. The service guys and I were consuming ice water like it was beer at Oktoberfest. By this time it was too hot to be outside or inside, with both my phone and computer giving me heat warnings. Then in a fit of true insanity, most likely heat induced, I decided to cook. Leaving for vacation the following day, I was determined to eat the vegetables that had finally ripened in our garden. Any man in his right mind, which I obviously wasn’t, would have grilled, but we had ripe zucchini and I was hell bent (pun intended) on making one of our favorite meals. This would involve doing the top two things you should never do in a hot kitchen — boiling water and frying oil. At one point in the cooking process, I realized that the house could have been in flames around me and I would have had no idea. It was the definition of a “hot mess”. After dinner, and perhaps a result my cooking, the UEI IND151 heat sensor would register a high of 97.5 degrees in the house, shortly before the new AC would kick on. “Fire” and “heat” are perfect metaphors for Hell. “Crazy from the heat” isn’t just an expression, it’s a reality…I know I lived it. Johnny Cash got it right when he sang “we got married in a fever, hotter than a pepper sprout”. But more importantly, I was reassured that people can be kind and generous. Neighbors offered sympathy, fans, shelter and refuge. A neighbor we had only known for a short period of time offered us their home while they were on vacation. Others insisted that we come by and use their pools to give us, and our dog, a break from the heat. The heating and air conditioning company we used wasn’t our first choice but turned out to be the best choice. The first company told us it would be three weeks before they could schedule us. My wife tried to reach them unsuccessfully for days, trying to move up the date, concerned about the health and well being our family. Not getting a return call, she turned to a local family owned business by the name of Snell & Sons, who had sympathetic ear and a reserve of AC units for just this type of emergency. They were able to install it sooner, for less, and were completely in tune with our situation. Our lives are busy, often leaving little time to socialize with our neighbors or friends. We default to email or social media because it’s quick and easy. But this experience reminded us of how effective, and important, person-to- person communication can be, and like air condition, how often we take it for granted. People can, and still do, look out for one another. They can be sympathetic and generous, reminding us that we’re not alone in this world, even though it may seem that way sometimes, and that, a small business can often offer something large nationwide providers can’t, or don’t — empathy. The best of them know that the lifeblood of their business is referrals and customer loyalty. They don’t need to offer elaborate rewards or points to gain, or keep, a customer. Most likely, the customer is won or lost based on how they respond to the person on the other end of the line in their time of need. And they know, when the time comes, that experience will be shared with others. It’s often said that we live in a “small world”, and in a situation like this, we’re reminded of why that is a good thing. A week doesn’t go by that I don’t hear clients express concern about their ability to produce a consistent flow of quality content, yet every day my inbox is full of emails offering white papers, research, webcasts and blog posts. So we set out to solve this “paradox of content marketing.” How is it that clients are not able to produce quality content for their purposes, but I get an average of 35 emails a day offering me content? With the help of our summer intern, Sergio Pianko from Georgetown, I archived a weeks worth of content related emails sent to my primary work email. 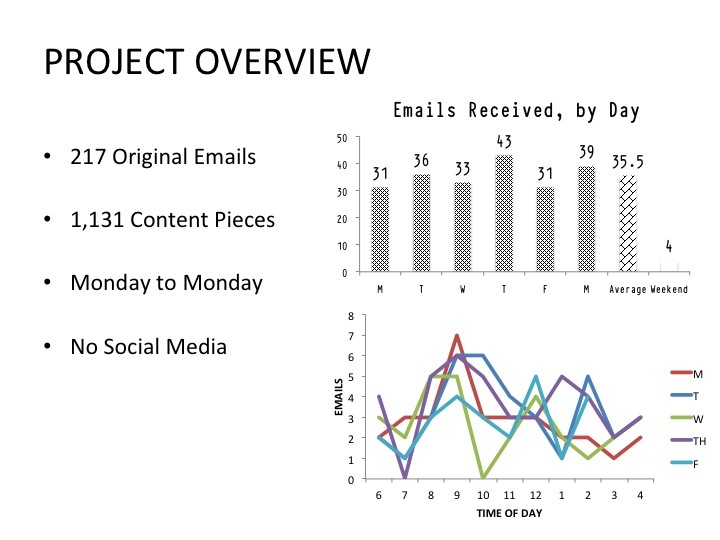 For this experiment, I did not include any other personal email accounts, social media or offline publications. For the week, I received 217 unique emails containing access to 1,131 pieces of content. Thursday was the peak day of the week, which surprised me, with 9 am being the peak time of day, which didn’t. I received an email offering me content, on average, almost every 15 minutes. A new report by the CMO Council entitled Better Lead Yield in the Content Marketing Field found that 87% of the respondents said that online content plays a major or moderate role in influencing vendor selection. The content they trust and value most? Professional association research and whitepapers 67%, industry research reports and whitepapers and customer case studies. The least valuable was vendor content, with 67% saying they don’t trust it. What’s in my inbox? Well, I’m partial to content aggregators. My two favorites providers are MediaPost because of their ability to narrow the scope on relevant topics, and their expansive content producers (including this author). I also like SmartBrief publications, they provide e-newsletters on behalf of others, like the BMA. I find the layout to be quick and easy to peruse, and they usually feature a research offer. 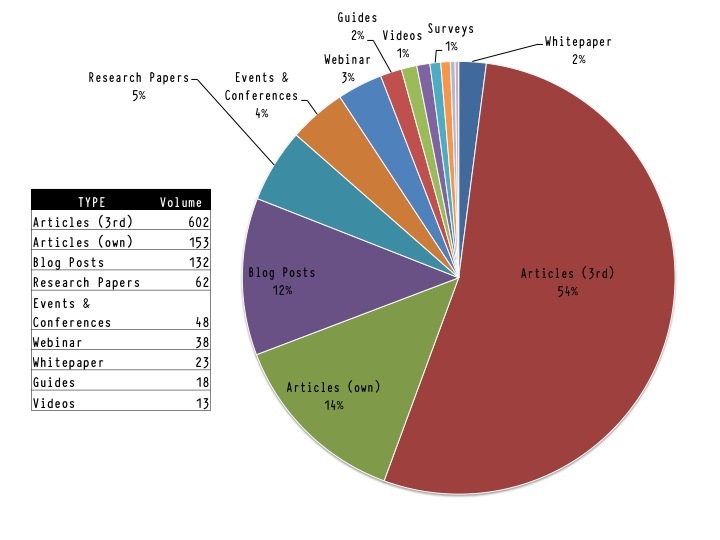 It was interesting to see that even though White Papers were mentioned to be the most valuable content piece according to B2B buyers, it represented less than 2% of the content I received. Downloading content that you offer for free does not make me a prospect. Save the $25 dollars you’re spending on the outbound telemarketing call and use it to track my behavior until I am qualified. Still not enough for you, we get that “free” comes with a price so consider this payment. According to the CMO Council report 87% of B2B buyers share your content with 5 or more people. Remarkably, 28% mentioned that they share it with more than 100 folks. 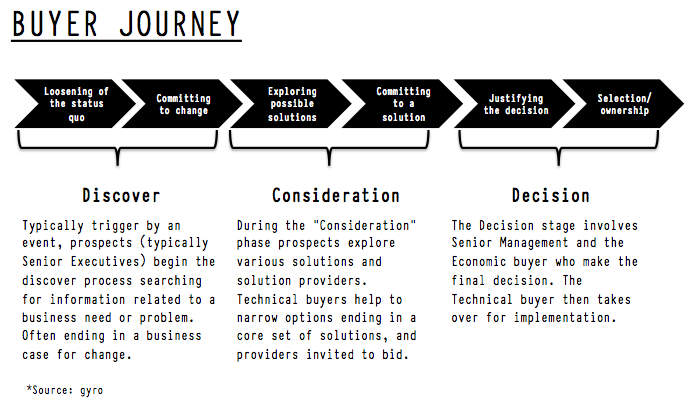 The first phase of the buyer journey is research. A prospect can cycle in this phase for weeks, even months, never reaching the next step, which is the business case. If you want to qualify real prospect, focus on providing them content that is related to making a business case for buying your product or service. For lead nurturing, overweight the scoring for pages or content that relate to this as well. 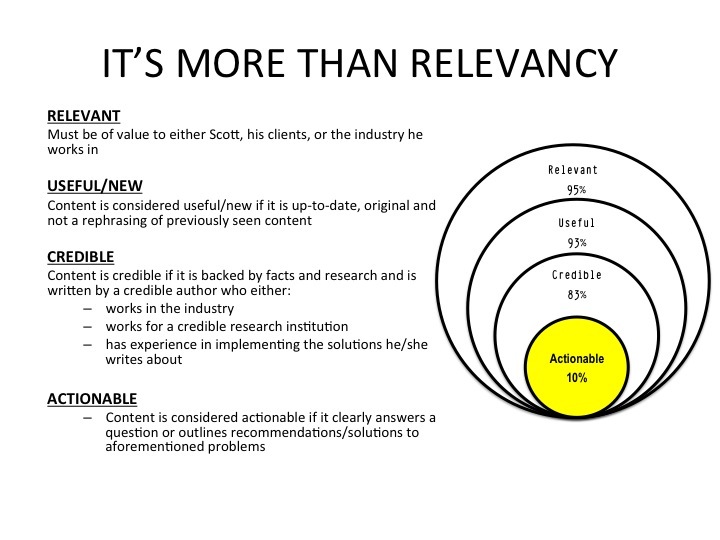 Sergio sorted the content using four filters; Relevancy, Usefulness, Credibility, and Actionable, based on the definition in the chart (below). For the most part, I had selected information sources that produce relevant content, and because of my use of aggregators it kept me informed about industry develops or issues relating to my clients. We then check into the backgrounds of the content authors and found that for the most part, they were credible using our definition (below). But along the way Sergio did discover a couple of frauds, not surprisingly in the social media space. The most interesting findings was that very little (less than 10%) of the content was “actionable” in that it provided recommendation/s or solutions to the problem or issue discussed. And most of the actionable content came in the form of Webcasts. As a content marketer this is the opportunity and, given its value, think strategically about how you deliver it. Because of the scarcity of this type of information, you can request an exchange of value with the audience, be it contact information, attendance at a webcast, etc. Numerous studies have pointed to the growing influence and use of video content. Yet it represented only 1% of the content I was offered. Yes, it is more complex, time consuming and expensive but it will also drive better results. It’s worth exploring, from past experience early innovators reap the greatest rewards. To understand some of the findings it may be helpful to know my email and content profile. I am an active content seeker and email deleter. Unlike some colleagues and friends, I like to keep a neat and tidy inbox. I delete emails early in the morning, and late afternoons. During the day I may delete emails as previews flash on the screen. Also, because of my consulting background, I am drawn to market research and data oriented content. I download and archive many items that I later review…typically on planes. That’s my content “persona.” Agencies have been creating audience personas for years and now, if you’re a client side marketers, it’s your turn. According to the Demand Gen Blueprint survey only 25% of marketers have developed buyer personas, and of those who have, only 35% have mapped content to buyer stages. To win, you have to make it in the inbox, get the email open and the content viewed. The organization that does that best, in this man’s opinion, is IBM. For their insight into the C-Suite, quality of research, and frequency of contact…which is only when they have something of value. They are the only “vendor” I let in my inbox. Runner up is McKinsey, for their “big picture” thinking and ability to take complex problems and explain them in very simple terms (especially in 2 min videos). Best New “Up and Comer” is the Aberdeen Group, a recent change in their business model allows free access to quality research, which this “freegan” appreciates. 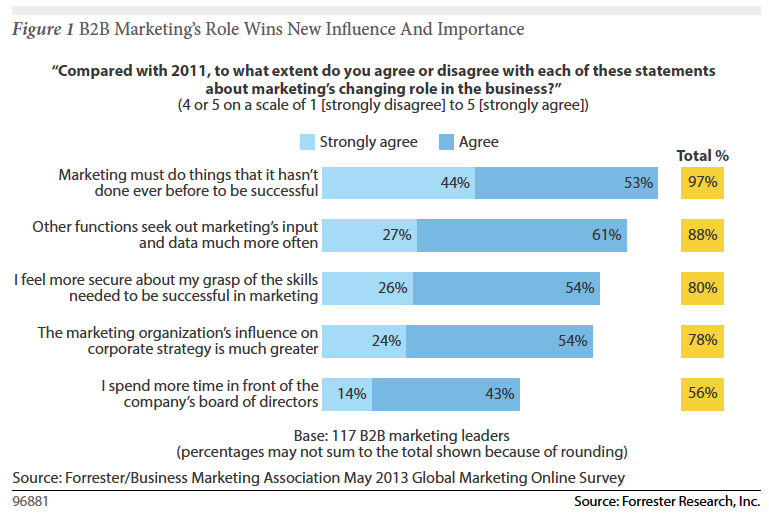 Content marketing will only grow in importance for business marketers over the next few years. There are opportunities to get your information viewed, and shared, but to accomplish that you have to understand your audience’s content consumption behavior, provide them something of value, and deliver it in the channel and/or through the content provider they prefer. There is a lot of work to be done, so have at it. Looking for a starting point, do a similar experiment with your customers. Ask them to send you a weeks worth of content related emails, you’ll be surprised by what you find. This time of year, America’s third or fourth (depending on where you live) most popular sport gets its moment in the sun. 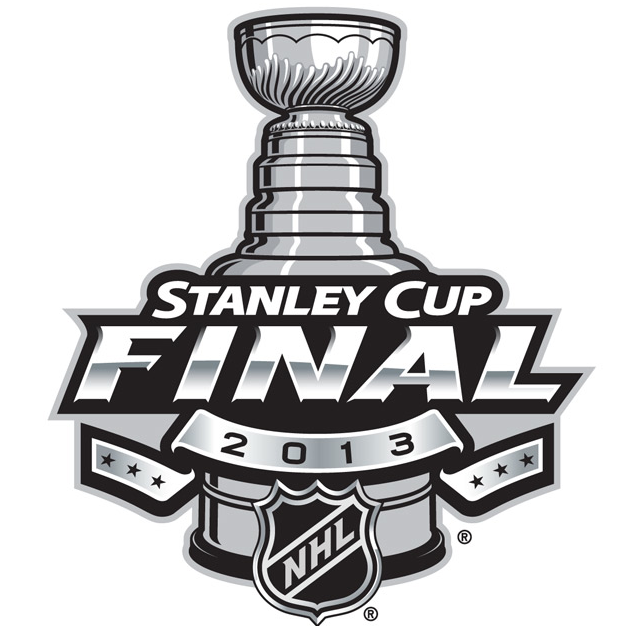 The Stanley Cup finals begin this week and the nation’s attention turns to ice, hockey sticks, pucks, and maybe mullets. For business marketers, the “holy grail,” or in this case the “Stanley Cup,” has been trying to demonstrate the business impact of social media. Not defined by adoption, usage, or engagement, but by influence. Proving that social media and/or social networks can influence buyer behavior. New insight suggests that it might be time to lace up the skates and put on the pads. Word of mouth (WOM), defined by person-to-person communication be that in person or over the phone, is and has always been the most used, and most influential channel for business buyers. Sometimes also described and measured as NPS (Net Promoter Score), it is the “Wayne Gretsky” of driving influence among decision makers, both in new acquisition, and for renewal. Unlike WOM, Social Media has struggled with demonstrating influence. Adoption and usage rates continue to grow, but the impact on B2B decision makers has been difficult to nearly impossible to measure (btw – this is not unlike other, more established media channels). That was until now. Research from Buyersphere may give us a clue to how social media may influence decision makers in the near future, and it has given us a couple of “hockey sticks” and a “puck” to play with. According to Buyersphere’s Annual Survey of B2B Buyer Behavior, even though buyers mention social media (and providers such as Twitter, Facebook and Linkedin) when asked to rate their usage and the usefulness of channels when searching for vendors, they fall off the grid when asked to evaluate their influence. As you would expect, word of mouth came out on top. Diving deeper into the research, it revealed a few game changing findings. Twenty to thirty year olds (Gen Y), act like no other previous generations. 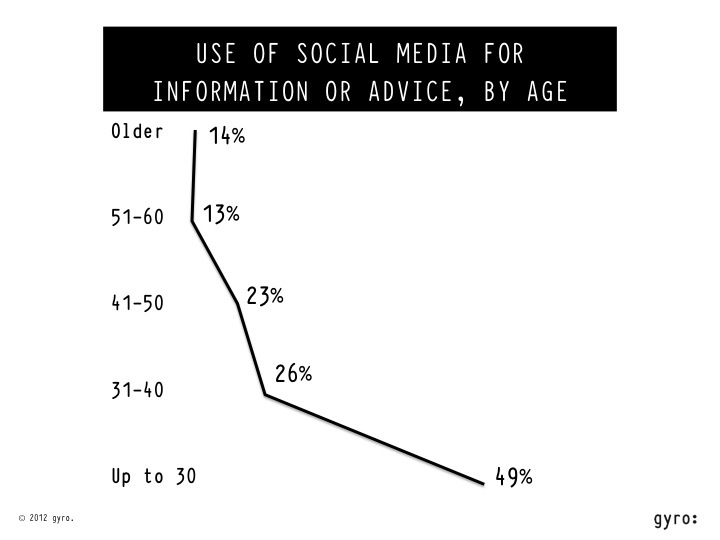 The first “hockey stick” is somewhat known — twenty-something business buyers are roughly twice as likely to seek information or advice from social media as the generation before them (31-40 year olds). And almost four times more likely to than the baby boomers (51-60 year olds). The second hockey stick, and the one that may end up being somewhat problematic for marketers, is that 49% of Millennials stated that they wanted to create and publish their own professional content. They not only want your content, but they also want to be able to disassemble it and repackage it with their own point of view. And finally, the puck to play with is that buyers under 30 are the only group that describe word of mouth as social media first, and then phone or in person. Close to 50% of Gen Y buyers defined WOM as any social media, in person or phone, mentioned by only 33% of the respondents. Buyers 40-50 by contrast, define WOM as in person or phone 60% of the time with any social media platform only 23%. Marketers most powerful and influential channel is now being redefined, and this presents the best opportunity to date to demonstrate the impact of social media on buyer behavior. “To skate to where the puck is going to be” as Gresky used to say, we need to plan now. To define the approach we need to understand the components of “social media” that are often lumped together – social networks and social media. Social networks refer to the connection among users and their social structure (friend, business acquaintance, etc.). Social media is defined as the online channel used to generate, access and distribute content. The distinction is important because of the way different generations of business buyers use and value them. This is key to unlocking influence. We know that their social network heavily influences Gen Y, more than any other generation. We know that half of them want to produce and share their own content, 60% upload content to the web, and 62% rate products and services on the web. So for Enterprise accounts, where Gen Y is 5-10 years from occupying the C-Suite, take a lesson from McDonalds and “grow your own customers.” Get Gen Y hooked on your content by involving them in your brand and making your content modular so it’s easy to repackage and share. The route to influence is through cause marketing efforts delivered via mobile devices. Thirty-seven percent of Millennials say they are drawn to products with co-branded campaigns. For small businesses, which Gen Y owns close to 1 out of 3, according to the Executive Council of Small Business (ECSB), the goal should be to make them advocate for your brand, product or services to their network. To do that, focus on issue resolution, the number one loyalty driver. For prospects, provide them with information that is useful. According to the ECSB, the number one pain point for all small business owners is sales and customer acquisition; being twice as prevalent among Gen Y owners. Specifically, lead generation and successfully competing with other small business owners. Help them understand how your products and services can help them grow their business. 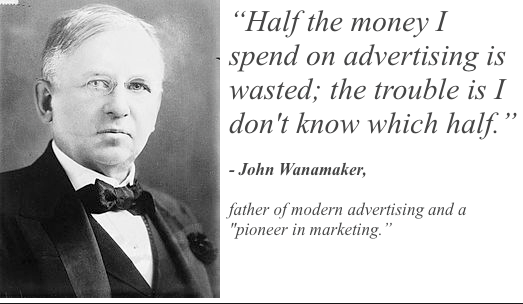 John Wanamaker was an innovator, a merchandising, and advertising genius. But when he made the statement; “Half the money I spend on advertising is wasted, the trouble is wasted, the trouble is I don’t know which half.” He left legacy that has haunted marketers ever since. With the wide spread adoption and utilization of CRM (84% of the firms surveyed), marketing automation, and analytical forecasting tools, the question is how can this be? Here are some thoughts on why this might be happening, and five tips to help you improve your forecast. Impurities in the System – let’s go after the big one first. “Garbage in, garbage out”…as they say. There’s a laundry list of things to look for — from reps putting leads in the system right before they close, to not updating opportunity consistently, and leaving in dead leads too long. Sales Optimism – yes, the economy seems to be recovering but it may not be moving at the “speed of sales.” Sales folks are an optimistic bunch; they want to believe things are better than they may be in reality. For example, the average length of the sales cycle. In a report earlier this year by BtoB Magazine, 43% of marketers reported that the sales cycle had increased over the last 3 years. Which is consistent with the CSO Insights report where 42% of Chief Sales Officers stated that the sales cycle had lengthened, in particular with new acquisitions. Incentives & Goals – take a look at how reps are being incented, and/or their sales goals. You may find the reason why reps leave opportunities in the pipeline too long, and/or are over optimistic with their forecast. Pressure to build and maintain pipeline can sometimes cause counter productive behaviors. Gut Feel – even if the troops in the trenches are putting in accurate and timely data, the generals may change it to fit the political environment and/or their own personal bias. Changing Buyer Behavior – recent research has shown that the buyer’s journey, and the typical sales process are not aligned. Buyers frequently start and stop the journey, or will cycle at a stage, and even move backward in the process. CRM systems are typically designed in a linear approach, progressing from a lead to a close. It’s an internal view, and increasingly out of alignment with buyers’ preferences. Active Pipeline Management – The pipeline and forecast will never be 100% accurate. That said, you should have a feel for how far off it is, and what is needed to improve. For example, do you have an inspection process to keep the pipeline current? If so, consider doing it more frequently. Move quarterly reviews to monthly. Also, if everyone is responsible for updating the pipeline, then no one is responsible. Consolidate the “maintenance and hygiene” of the pipeline to one person. Others may be responsible for providing updates, but one person needs to police the system. Discount Probability and Value – conduct a post-mortem on past forecasts over last year or two. Assess the difference between forecasted and actual results. Create discounted probabilities based on that delta for: lead movement (from stage to stage), and lead value. If implemented, evaluate the accuracy of your “pre-set” discounts. It should help bring forecasts more in-line and ground “sales optimism” in a bit of reality. Govern the Process – to improve the accuracy of “output”, focus on implementing and managing a standard process. Accenture’s Connecting the Dots on Sales Performance found inconsistencies among reps in using their company’s defined process and methodologies to selling. A quarter of Chief Sales Officers surveyed stated that sales reps used their sales methodologies 50% of the time, 31% said it was used 75% of the time. Leverage Marketing – close the feedback loop with marketing to improve the quality of leads from campaigns and activities. In a report on Sales & Marketing Alignment by the Aberdeen Group, marketing accounted for 47% of the sales forecasted pipeline in the Top 20% of companies studied, compared to only 5% of laggard organizations (bottom 20%). Utilize Business Intelligence Tools – high penetration rates of CRM may equate to high visibility, but doesn’t automatically mean that it provides the best insight. 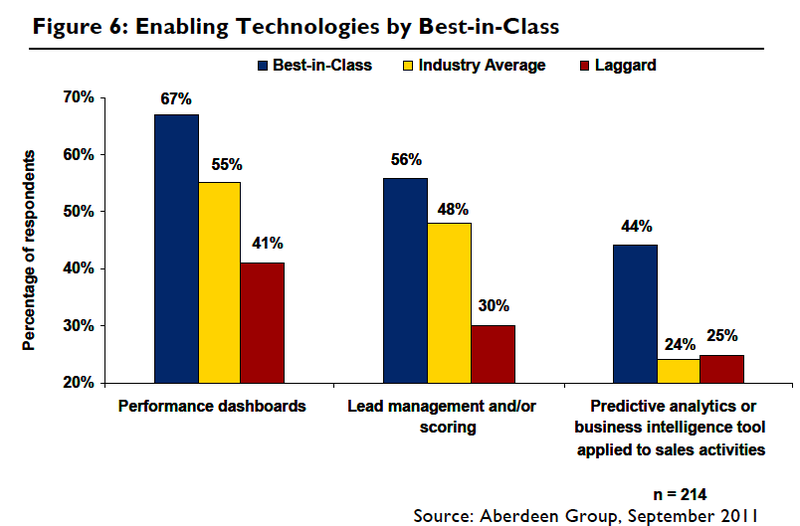 Despite high adoption rates of performance dashboard, few companies are using business intelligence or analytics tools according to the Aberdeen Group report on sales forecasting. However, the report found that 44% of the highest performing sales organizations were using predictive analytics to reduce “gut feel” in the forecast. Helping the troops become better soldiers through coaching should help improve the accuracy of the forecast. As well as, implementing the tips mentioned above. But you may still find that half of the pipeline is wasted, but hopefully, unlike Mr. Wanamaker, you’ll understand which half. I grew up in a factory town, a community of craftsman. At 15, my grandfather watched as they built the factory where he would work for fifty years. On the day it opened he got a job working on the assembly line. At its peak, it employed 10,000 people. During that time, the town grew and merchants prospered. But as production at the factories slowed and the work moved overseas, the merchants began to feel the impact, and when the big box retailers rolled in, it killed them. By my teens, the new reality was high unemployment, vacant storefronts, and the once thriving downtown shopping area was now a ghost town. The site was originally designed to be an e-commerce platform for handmade items, on the belief that hand crafted items had “an intrinsic value” that should be given a forum outside of traditional retail. 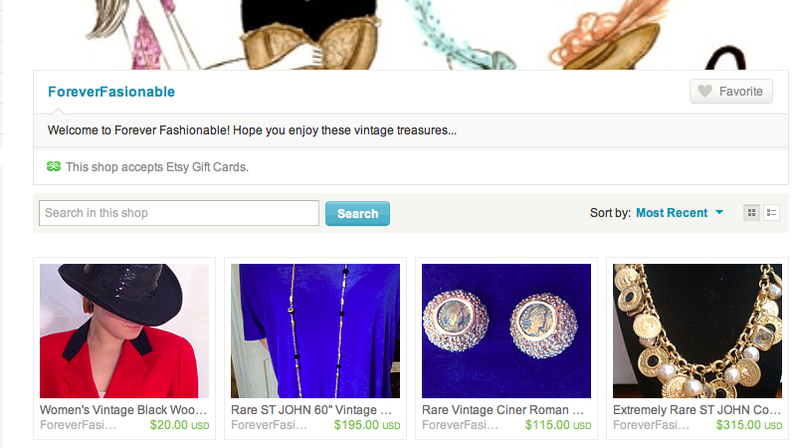 Etsy has since modified its policies to include designers of goods, and curators of vintage goods (20 years or older). It provides users (shop owners) a virtual storefront on the internet for a small fee of $0.20 per listed item. Providing global scale for small shop owners who design, build, or curate items such as art, jewelry and other handcrafted items. Unlike the Fancy or Ebay, Etsy puts the focus on their shop owners, which now number 800,000. Visitors can read shop owner’s profiles, follow them, and see the items and shops they favor. 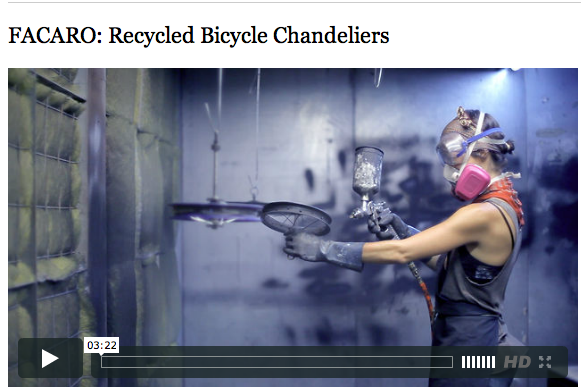 Perhaps most interesting is the video series Etsy has created to tell the stories of it craftsman and curators, celebrating their passions, interest and ambitions. It now acknowledges that not every designer actually has the desire and/or capability to build what he or she designs, permitting production to be outsourced to someone else. Perhaps the most shocking change is that Etsy is piloting integrating into mainstream retail through an arrangement with West Elm (owned by Williams Sonoma) that would bring Etsy merchant’s products to the shelves of the nationwide chain. For now, Etsy won’t put big box retailers out of business any time soon, but given the current state of retail it may be an evolution that is much needed. With the evolution of ecommerce and the rise of big box retailers also came the coldness of impersonal transactions. Etsy offers its 25 million members the opportunity to develop a relationship with shop owners, to become an admirer of their work and/or appreciate their eye for style. A chance to do business on a personal level again, with someone they know, and/or share a similar interest or passion. And as a result, it changes the buying experience from one of procuring an item because of the functionality or utility, to one of investing in the uniqueness of the idea that originated it, and in the skill of the craftsman that produced it. Etsy offers all the things you loved about doing business with a small proprietor or craftsman in your local community without the geographic limitations. It’s an opportunity to reconnect to humanity and to the small merchants that built the downtown you knew as a kid. Why do we do it? No one is forcing us. As Christopher McDougall points out in his brilliant book, Born to Run, we no longer need to chase down our food. So why do we do something physically and mentally challenging, and occasionally painful, if we don’t have to. Why not just take it easy? This was the conversation inside my head early this weekend before the Cherry Blossum 10 Mile run in the Nation’s Capital. In fact, it’s the same conversation I have before any race. Why would anyone in their right mind stress themselves out for a week and get out of bed at 5:30 am on a weekend to run. I spent the first 2-3 miles of the race observing people trying to answer that question. From what I saw, some folks run to challenge themselves, some run for others, like the a guy in a yellow kilt running for fallen combat soldiers, the woman with a picture of her deceased cat on her shirt, and of course, the group of sickos who do it because they actually enjoy it. Up until my 40th birthday, I had successfully avoided running, while slowly turning myself into a “fat and happy” sedimentary “couch” potato. That was until a colleague of mine issued the challenge of doing a sprint triathlon as a way for us to celebrate our 40th birthday (thank you Patrick). Since that time, I train regularly and do various types of endurance races. Along the way, I dropped the 25 lb. bag of potatoes. I’ve gotten into a routine of training, but I hadn’t totally figured out why I continue to do races until this weekend. Alone with my thoughts for the next hour and half or so, I committed to figuring it out. I know that I need to pick events that give purpose to my training routine. But the epiphany came at mile 5 when I realized that I think I actually like to scare myself to remind me not to become complicit and/or too comfortable again. My approach is to pick events I’ve never done, and to usually do them alone, because it heightens the fear factor. The days and night before the race is spent stressing myself out about the course layout, logistics, and perhaps, most importantly, the locations of bathrooms. But along with the fear and the stress, I know there is also the heightened sense of accomplishment. By mile 9, I realized that this habit had spilled over to my work life. I left a comfortable position three years ago to enter a new industry, and to start a new business with gyro. I “had it good,” but I decided shake things up, I had become in a sense “fat and happy” in my career. Like training, we can easily fall into the “habit” of just going to work everyday. In fact, some probably dislike it as much as I dislike running. And I wonder if that might be because our work life sometimes lacks that “event” to give it purpose. It’s easy to fall into a routine and become comfortable. Life itself can be complicated, so why make it more difficult? Perhaps a big, fat scary goal is what is needed give greater meaning to our work, and to reenergize us. With that fear of the unknown, and/or the unaccomplished, also comes the reminder of what it is to be alive. 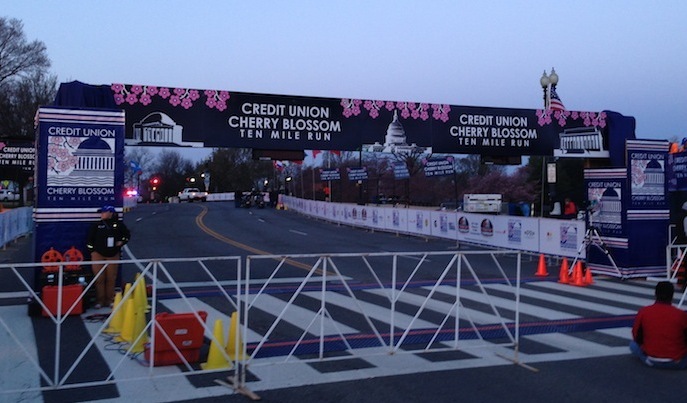 Posted on April 7, 2013 April 8, 2013 Categories 2013Tags born to run, career, cherry blossom 10 mile run, Christopher McDougall, goal, goals, jobLeave a comment on Why Do People Run?